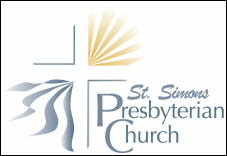 The men's ministry at St. Simons Presbyterian consists of weekly Bible study opportunities as well as participation in several annual church traditions such as cooking for the community Thanksgiving breakfast and serving food at the Presbyterian Women's Christmas Luncheon. Whether a member, visitor, or seasonal worshipper at SSPC, we hope you will find ways to become involved! The Men's Noonday Bible Study meets throughout the year each Monday at 12P. Led by Rev. Alan Dyer, this hour-long conversational study explores different books of the Bible. During the fall and spring, participants take turns providing a meal for the group. During the summer, everyone brings a "brown bag" lunch with them to the study. This study regularly welcomes visitors, snowbird worshippers, and friends - all are welcome! The Men's Breakfast Bible Study has been meeting at St. Simons Presbyterian for several decades. Although several SSPC members help to organize, this is truly a community-wide study with participants representing all different churches on the island. Local pastors - including from SSPC - take turns leading the study. Participants are asked to bring $5 to help cover the cost of the breakfast.